Relax By The Pool! Enjoy Coffee & Cocktails on the Lanai! Is a 4BR, 2BA waterfront property with comfortable accommodations for up to eight (everyone gets a bed) located in the same development as Dolphin's Run. Enjoy the open concept floor plan which encompasses the fully stocked kitchen, dining room, and family room (with 50" HDTV & DVD player and wireless internet). The Family Room, Dining Room, Kitchen, Lanai and Pool, all face the waterfront where the fish jump happily every morning during your coffee on the lanai. The formal living room faces the front of the home ensuring plenty of room for everyone. Let the kids run free in the private, fully fenced yard with optional (removable and childproof) pool safety gate to ease your mind. Tie up your boat to your private dock and the Tampa Bay is at your doorstep. Or try your hand at fishing, kayaking or stand up paddle boarding off the dock in your private back yard. 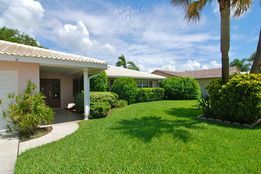 4BR/2BA Child Friendly, Pet Friendly, Waterfront Pool Home with Screened Lanai and Private Dock! CLICK THE SLIDESHOW BELOW ! Mermaid's Cove is a 2000 sq ft, 4BR/2BA, waterfront (access to the Tampa Bay), pool home with a private dock, screened lanai, and fully fenced back yard. Non smoking, pet and child friendly this home has a fully outfitted kitchen including refrigerator, stove, dishwasher, microwave, toaster, coffee maker, blender, out door gas grille, and more. Cable TV in living room, family room, and two bedrooms. DVD player in Family Room. Wireless internet. Full sized Washer & Dryer, Iron and Ironing Board provided. Short Term Rates vary depending on season, and length of stay. Special Rates available for stays of six months or longer. Please submit inquiries from the Contact Tab. Please specify your desired property and your dates of stay. All Rates up to 5 persons. Additional guests: $30 per person/per night. Assuming no damages, $500 Security deposit refunded within 2 weeks of check out. Rates may change without notice prior to confirmed booking. "3 short term rentals as defined by City code available in a 365 day period." Please inquire.